We’re doing a new mural for the Spot Prawn Festival 2018! Written by Carson Ting. Posted on May 10, 2018. Filed under Blogging, Murals. Tagged mural, octopus, spot prawn festival 2018. Bookmark the Permalink. Both comments and trackbacks are currently closed. We’re stoked to be invited to paint our biggest mural yet for the Spot Prawn Fest by False Creek’s Fishermens Wharf by 1505 West 1st, Vancouver right by Go Fish. 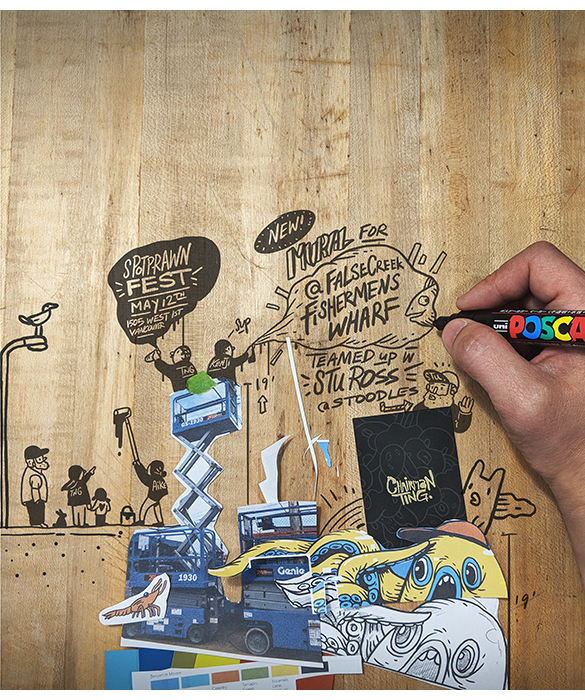 We’ve teamed up with the super talented art director and designer, Stu Ross. Come see us paint this giant octopus measuring approximately 100′ x 19′. We’ll be prepping tonight with the amazing help from Kenji Rodriguez from Gamomo Creative Labs and our amazing intern extraordinaire, Aiken Lao. We’ll be painting from Friday to Saturday and then a little bit on Sunday, Monday and Tuesday. Come by to say hi!